Authorities fear camps could become permanent fixtures and hinder Venezuelans from integrating into society. But with over one million Venezuelans now living in Colombia, officials said they had no choice but to offer tents to destitute migrants. 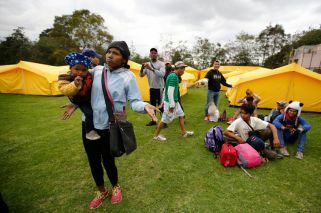 Colombian authorities have moved homeless Venezuelan migrants to a football field filled with yellow tents and cots, as the number of migrants fleeing their nation's economic and humanitarian calamity continues to rise. The first migrant camp for Venezuelans in Colombia's capital sparked a protest from residents on Tuesday who said they feared their new neighbours would bring crime and disease — the latest hint of escalating tensions throughout the region over the spillover of Venezuela's crisis. "They want to ruin our communities!" a man cried out from his balcony overlooking the field of tents, later switching to English and yelling: "Welcome to the jungle!" Colombian officials had been reluctant to set up refugee-style camps, even while similar sites have been created at Ecuador's border with Peru and in Brazil. The new camp is modelled after a temporary refugee settlement for Syrian arrivals in France. 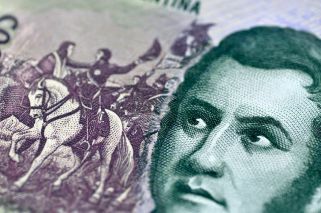 "There's nothing else left to do," said Cristina Vélez, Bogotá's secretary for social integration. The migrants taken to the camp had been living in a park outside a bus station in conditions considered a potential public health risk. Families with young children were living cramped together alongside railroad tracks and cooking food over makeshift fires. Many had reached Bogotá after long walks by foot and didn't have enough money to rent a room. Vélez said Colombian officials talked with their counterparts in Paris over Skype to determine how to create a temporary camp, settling on a model that would keep families together while dividing up single men and women into separate tents. Migrants will be allowed to stay at the camp for up to three months and will be given information on accessing education and healthcare. As officials transported the Venezuelans to the new camp in Bogotá, a dozen angry residents stood in front of a gate attempting to block their arrival. Residents in a large new condominium sat on their balconies now overlooking a field of yellow tents and cots and took photos. Several said they were angry officials hadn't given them advance notice while others worried Venezuelans would take their jobs. "Not even animals should be there!" Giovanna Sánchez, 35, shouted into a microphone outside the camp. Ivonne Jaimes, 27, cried as she sat on a cot with her one-year-old son wondering when she would be able to bathe him. She feared they would end up spending more money living at the camp since they are not allowed to cook inside.